Hello again dear reader(s). Sorry about the woeful lack of posts recently but we have been busy upping sticks yet again and moving back down south to Brighton by the sea. 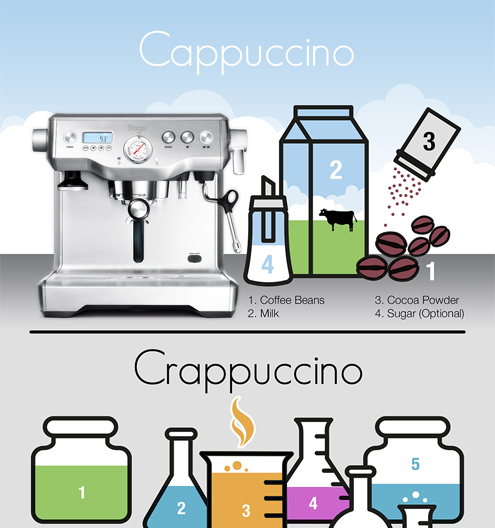 Normal yumblogging will be resuming soonish, but in the meantime here is an infographic what I done did to illustrate an as yet unwritten yuckblog on instant ‘cappuccino’. Hope you all had a good Christmas. Welcome back! Hope you’re settling in nicely in Brighton. Great graphics, what program did you use? Hi Em, settled nicely thanks. A combination of Microsoft Paint and Word Clip Art. …or was it Illustrator and Photoshop?